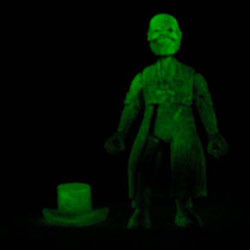 The ghost is named "Skeleton" for the action figure, but is commonly known as "Ezra" by Mansion enthusiasts such as myself, so that's how I'll refer to him from here on out... Ezra is my definite favorite of the three infamous Hitchhiking ghosts probably because he is the most "ghostly." The other two hitchhikers just look like regular people with cartoony features while Ezra sports a cool skull-ish head (which actually appears throughout the ride in paintings and pop-up scare gags), which has a really unique look to it. However, the figure does not maintain that style. As always, the sculpt is very simple and actually kind of confusing. The likeness is... well its got the bald-guy hair, no lips and nose, but other than that, the head in no way resembles the animatronic. As this character's trademark is his cocked-eye bony smile, I can't fathom why more care wasn't given to this figure's head - it is hands down the worst likeness in the entire series. Ezra's coat is open and his sleeves appear to be rolled up. The coat, as far as I know, is buttoned-up on every Ezra animatronic on the planet, so why the figure's is open is beyond me. What's worse is that the majority of the coat is a soft PVC piece that inserts into a slot around the torso. The problem with this is that the PVC piece doesn't fill up the entire slot and leaves visible gaps in the front of the figure, not to mention the seam that runs around the torso. Then, for some reason, this sculptor decided to put the sleeve cuffs at the elbow. It's a confusing move, but not as much of a problem as the coat or the hands. But what's wrong with the hands? What isn't!? Rather than doing the left hand with thumb extended (like the other two hitchhiking figures) and the right hand able to hold his hat (again, the other two ghosts can hold their accessory in their right hand), Ezra sports two closed hands with cylindrical shafts in them to hold ... nothing! No accessories fit in there and the thumbs are attached to the finger so you can't even wiggle the hat in there. Plus, the body is very poorly proportioned and horribly out of scale with the other two hitchhikers. The only decent thing about this figure is his 14 points of articulation (neck, balljointed shoulders, elbows, wrists, waist, balljointed hips, knees and ankles). The figure is cast in light blue with a gray wash over it, a tan wash over that and a "smoky" wash of glow-in-the-dark paint over that - so yeah, he glows, but the glow depends on the thickness of the paint and how thorough its application is. 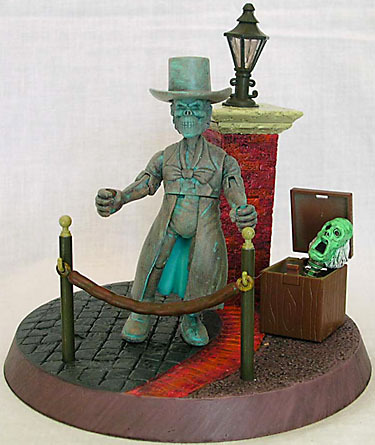 Accessory wise... well, he's got a ridiculously over-sized top hat (painted the same as the figure) and a box with a pop-up ghost head in it. The box is the same as the one that comes with The Bride figure, but the pop-up head is a new sculpt. He also comes with a fairly cool "stone" urn with some "some" vegetation "in" "it." There's a nice wash on the urn and good detail work on the plant (it's a separate piece and is cast in something like rubber). The base is easily the worst of the entire series because it's even more confusing than the sculptural choices; there is simply nothing ride-related to it. It's circular with a semi-circle of what might be bricks separating cobble stones and dirt. There is a very nicely painted brick column that sports a light-up lamp on it, but because a notch in the pillar, it has to be placed with the light's button facing outward, toward the viewer. There are pegs to help with standing, but they are right behind two poles with a removable velvet rope. This is at best a terrible reference to the bat stanchions and chain links in the ride-load areas or, at worst, the velvet rope in front of Studio 54. Overall, there is just no redeeming quality to this set. It's like they said to themselves, "we'll make two of the hitchhikers decent enough to buy and then not even bother with the quality of the third!" Ezra is just frustrating and angering that so much could go so wrong, especially in a line like this that actually does seem to have some thought behind it. Why is this thing so cheap? Tell us on our message board, the Loafing Lounge.